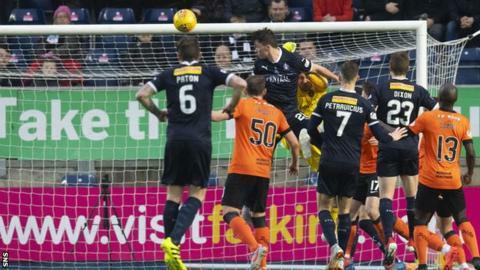 Dundee United lost ground in the Scottish Championship title race after conceding a late leveller at Falkirk. With United leading after Cammy Smith rammed in a Jamie Robson cross just after the break - and leaders Ross County trailing at Partick Thistle - it had looked like the two would be tied at the top. But Ciaran McKenna's thumping header - combined with County's eventual win - means United slip five points adrift. They do, however, move level on points with Ayr United in second, while Falkirk stay in ninth. Ray McKinnon's side welcome Morton in the first game shown on the new BBC Scotland channel on Friday, while United - who lost centre backs Freddie Frans and Rachid Bouhenna to injuries - host Inverness Caledonian Thistle on Tuesday. Falkirk manager Ray McKinnon said: "I'm disappointed we lost the goal just after half-time, but we showed good resilience to come back and get the equaliser. It was a great goal, on another day we could have won it. "It was a big point - we have to be competitive, determined and try and win as many points as possible. Although we are unbeaten we are still in ninth and over the next 11 games, it will be very interesting." Dundee United manager Robbie Neilson said: "I'm disappointed not to take three points as we played some good football. "This is a tough place to come. They are very strong, very direct, we lost two centre halves today because of the physicality." Goal! Falkirk 1, Dundee United 1. Ciaran McKenna (Falkirk) header from the centre of the box to the bottom left corner. Assisted by Ian McShane.